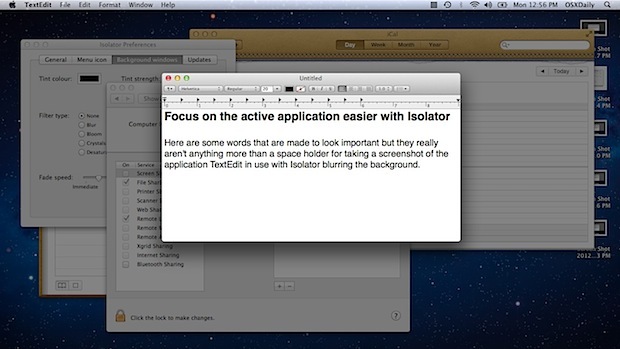 It’s easy to be distracted by other open applications and windows while using a computer, and sometimes even the best of us need a bit of help to focus. 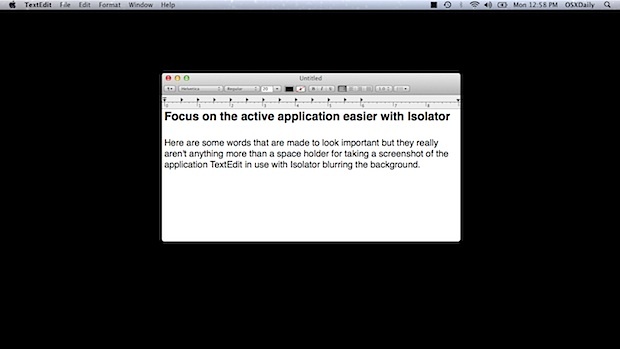 Lion’s full screen mode can be helpful, but when that’s not enough or when you need access to other windows and apps, then Isolator is your friend. Isolator is a free application that provides an easy way to focus on a single application at a time by applying various filters to everything in the background, these are fully customizable and even if you aren’t interested in the focus and productivity side of things, can make for a nice way to customize the appearance of Mac OS X. You can choose to tint the background, blur it, use a bloom effect, turn it into crystals, or make the background black and white while everything else is colorful. Both the tint opacity and filter strength are adjustable by a slider, leading to plenty of customization options. Screenshots and a video of some of these effects and filters are shown below. There are tons of other potential effects, and the tint color can be adjusted to anything as well. The more complicated the filter, the more demanding it will be on CPU and system resources when switching between apps, so keep that in mind if you have a slower Mac. Sticking to no effect but with a tint is very fast however and didn’t seem to have any negative effect on performance. If you’d rather not download another app, another option would be to enable Single Application Mode in Mac OS X, which automatically hides any app other than the one currently in use. Just tried it but unfortunately it slows down Spaces to a degree I find unusable. If you’re a heavy user of Spaces and switch desktops frequently, you may not get the best results. Think by Freeverse is similar and works great. I use Command + H to hide a current app. But more frequently use Command + Option + H to hide all the other apps apart from the one I’m using. Usually I use it this way … Command + TAB (to make active the app I want in the forefront) then Cmd+Opt+H to hide the other apps. One thing in Lion is when an app is Full Screen, Cmd+H doesn’t work. It needs a three finger swipe sideways to slide it off the screen.